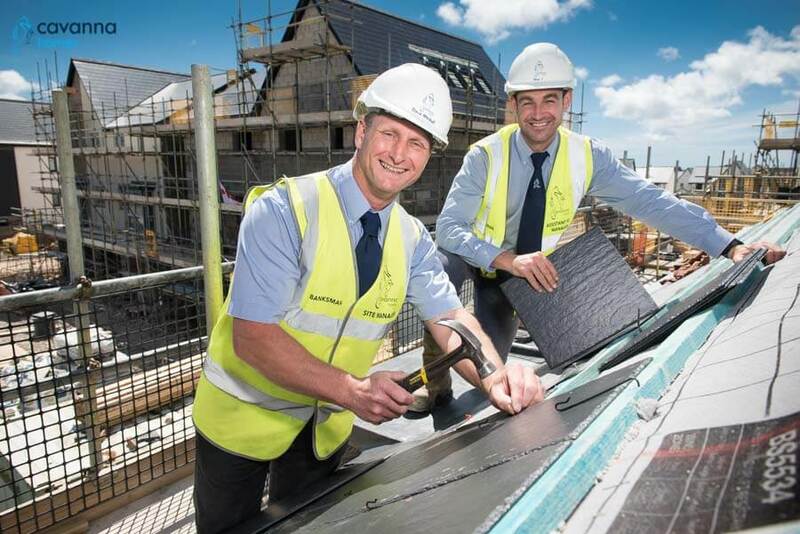 The final tiles being fitted to the rooftops of our last houses at our flagship development in Plymouth, mark the end of a seven year project to transform the site of the former Plymouth Airport into a new community. A topping-out ceremony with our Site Manager Dave Mitchell and Assistant Site Manager Guy Jary celebrated the final phase of building work on the development near Derriford. In 2011 we launched our biggest single development project in our 95 year history with Cobham Field on the disused approach to the former runway, parallel to Tavistock Road. The development was named after air pioneer Sir Alan Cobham who made his inaugural flight between Croydon and Plymouth in 1923. Phase two of the development was named 504K after the aircraft flown by Cobham. In the past seven years, a total of 345 homes have been built close to Derriford Hospital, Tamar Science Park and the University of St Mark and St John; 70 at Cobham Field and 275 at 504K. In support of Plymouth City Council’s carbon-reduction programme, we have fitted a number of solar panels on the homes for low-cost domestic hot water. New homeowners were also offered a free six month bus pass as part of the 504K Travel Plan to help reduce pollution and congestion as well as encouraging a healthier and greener lifestyle for the new community. Keith Miller, Managing Director of Cavanna Homes said: “504k has been a flagship development for Cavanna Homes and the biggest single project in the company’s history. Contemporary design and energy efficiency have been key features of this development, along with providing an excellent range of homes to meet all needs and budgets. “It has been a popular development which has attracted a great deal of enthusiasm since the outset. The proximity to the hospital and the university campus has meant that the homes have been of real interest to staff. We’ve also had parents investing in property for their student offspring. The fact that we’re on an excellent bus route to Plymouth City Centre in one direction and to Roborough and Dartmoor in the other, has also been a great selling point”. There have been a number of awards for the development team throughout the duration of the project. Site Managers Ian Crighton-Brown and Ian Rankin were both awarded the coveted Quality Award in the National House Building Council’s Pride in the Job Awards for their roles at the helm of 504k. The award is only received by 100 site managers nationally out of 16,000 who compete for the awards. The awards, which are now in their 38th year, recognise the exceptional contribution site managers make in creating high quality homes. Ian Crighton-Brown said: “Having been at 504k for five years, it has been a real privilege to see this huge site transform into such a fantastic development of new homes. “Our main priority was to provide a variety of homes to appeal to all home seekers from first-time buyers, to families and retired couples, and it is incredibly pleasing to know that we have helped so many people to find their perfect home at our flagship 504k development”. The final homes for sale include two spacious four-bedroom homes starting from £284,000 and a three-bedroom townhouse for £272,000. We are offering a number of special offers on the remaining homes for sale at 504k for a limited time only, including £1,000 towards legal fees and carpets and flooring added throughout the property.